Mobile giant unveils high-performance server processor as it breaks a new boundary in data centre hardware. Qualcomm has revealed its aim to break into the data centre market with the launch of an all-new Arm-based server processor featuring a major hardware breakthrough. 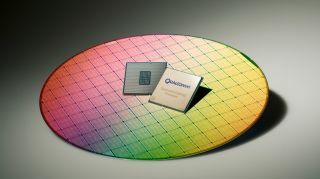 Revealed by the company's Qualcomm Datacentre Technologies arm, the new Qualcomm Centriq 2400 processor family will be the world's first 10nm server processor, meaning it can provide far faster output for companies running large cloud workloads in their data centres. Built using Samsung's 10nm FinFET process and containing 18 billion transistors, the Centriq 2400 family contains up to 48 high-performance, 64-bit, single-thread cores, running at up to 2.6 GHz frequency - all whilst consuming less than 120W of power. Qualcomm has already signed up a number of high-profile partners to show off the power of the Centriq 2400 family running on ARM-based data centres, including the likes of Alibaba, Google, HPE and Microsoft Azure. Qualcomm adds that the Centriq 2400 is also able to offer a higher performance-per-dollar ratio than the Intel equivalent Skylake hardware, showing its commitment to shaking up the data centre market, which is estimated to be worth $20 billion by 2020.